It features an elegant design in an attractive color that will match any decor. This kids toy chest has a huge storage space and lets you store all kinds of toys in it - big, small, long, or short. It has a flip-top lid that your kid can open and close easily. The lid has a safety hinge that is designed to protect your young ones from getting hurt, if they slam the lid down. This Toy Box is made with the safety features mind and does not have any sharp edges. 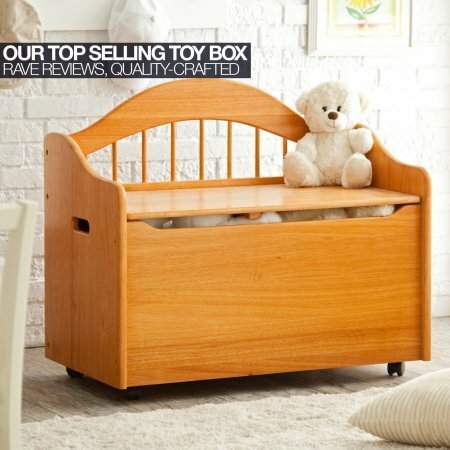 Made of sturdy rubberwood and engineered wood products, this kid's storage toy box will hold up for several years. You can also use the top surface as a convenient seat for young kids. It also has wheels that allow you to move it around easily. Easy to assemble, this Limited Edition Toy Box will help keep your kids room, organized and free of clutter. The focal piece in your kids room.